First Geosynchronous Orbit Amateur Radio Payload Could Aid Disaster Communication (12/24/2015) -- AMSAT figure and Virginia Tech researcher Bob McGwier, N4HY, reports the Amateur Radio payload planned to go into geosynchronous orbit in 2017 will be like "a new ham band" for the Americas, available every hour of every day. McGwier said the satellite's geosynchronous orbit also makes it viable for emergency and disaster communication. AMSAT-NA announced in April that Amateur Radio would be a "hosted payload" on the geosynchronous satellite that Millennium Space Systems (MSS) of California is under contract to design, launch, and operate for the US government. More here. Amateur Radio operators put their skills to work during historic flooding in the greater St. Louis area earlier this month. ARESÂ® volunteers from three counties contributed extensive time, talent and equipment to emergency efforts. According to Bill Grimsbo, N0PNP, District C Emergency Coordinator, "More than one hundred and seventy hours of volunteer service on the part of Amateur Radio volunteers working with response agencies were invested in District C during this emergency. These people commit their personal time as well as working regular hours at jobs that represent a cross section of America's workforce for the greater good of the community." More than 26 radio amateurs from St. Louis Metro ARES, St. Charles County ARES, Illinois Section ARES, and St. Louis and suburban radio club members worked with the American Red Cross in serving in excess of 19,400 meals and coordinating more than 640 overnight stays. ARES and club operators were asked to help coordinate communications among shelters in four counties and Red Cross headquarters. On average, the volunteers worked six to eight hour shifts using personal radio equipment while employing local repeaters maintained by area radio clubs to pass messages. They worked with shelter staff to fulfill the needs of hundreds displaced by severe flooding in the St. Louis area. Much of the radio traffic was handled on a repeater maintained by the Monsanto Amateur Radio Association, a repeater that had been damaged by a lightning strike in August. Repairs were completed just weeks prior to the onset of flooding in the area. 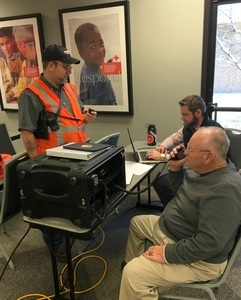 knowledge and equipment to connect any agency to another when in times of need," Steve Wooten, KC0QMU, St. Louis Metro ARES Emergency Coordinator said. "We can set up and be connected within an hour of responding to the call for assistance." St. Charles County Division of Emergency Management also called on ARES in that county to execute road closure reconnaissance for emergency services. Volunteers also performed "windshield" damage assessments where they drove by hundreds of homes, surveying them for minor to catastrophic damage. In a demonstration of solidarity in this disaster, St. Francois and Ste. Genevieve County ARES organizations worked together, assisting the Ste. Genevieve County Emergency Management Agency with 24 hour walks to assess the condition of the critical levees that protect lives and property in Ste. Genevieve County. Once again, the Centralia area in southwest Washington State was on Mother Nature's target list for December rains and local flooding. 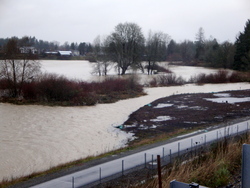 The week of December 2-8 brought continuous rain to the Pacific Northwest with very heavy rains on Monday, December 7th. Three major rivers -- the Chehalis, the Skookumchuck and the Newaukum -- quickly reached flood stage. The City of Centralia opened its Emergency Operations Center (EOC) on Tuesday, December 9, to get ahead of the potentially devastating flood waters. By 5 PM Tuesday, the Centralia ARES team was activated on a 24 hour basis. During hours of darkness, team members monitored the EOC Amateur Radio systems and helped set up the remainder of the EOC for a full scale response on Wednesday. members began the second phase of their response duties, performing "windshield surveys" to determine the extent and depth of water in each residential area in the city. Additionally, teams monitored selected high water points to provide eyes on the scene information on how fast flood waters were rising. Throughout the day, hams reported conditions block by block, response area by response area to the EOC and Incident Commanders. Late in the day on Wednesday, the area caught a break when the rains slowed and then stopped. By late Wednesday evening, even though the rivers were still climbing to flood stage, emergency managers could breathe a sigh of relief as it was clear the local flooding was not going to be the disaster we've experienced before when Interstate 5 was closed for days due to water over its roadway. Area wide, several dangerous landslides occurred and the Hwy 12 over White Pass to Eastern Washington was closed as the road was washed away in four locations. This pass will potentially remain closed for weeks or even months as snow on the pass hinders roadway repairs. More than three dozen countries took part in the 2015 Global Simulated Emergency Test (GlobalSET) last month, organized by IARU Region 1 and designed in part to measure the disaster readiness of Amateur Radio. IARU Region 1 Emergency Communications Coordinator Greg Mossop, G0DUB, pointed out that the 2015 event differed from other GlobalSETs held since 2006, which emphasized message handling and setting up stations in the field. "The IARU emergency communications coordinators decided that the best way to achieve this would be to have an availability or 'call-out' exercise," Mossop said. "It asked all countries with emergency communications groups to contact their members and ask them how quickly they could get on the air if required." The start of the exercise was not announced in advance but propagated via a variety of channels, including e-mail and social media. IARU regional coordinators chose December 18 as being clear of most social and cultural events. A time limit of up to 48 hours was set for potential responding organizations to complete the local callout exercise and submit results via a web form. The survey results covered an estimated 8466 members worldwide, of which 2048 reported they could be available in less than 1 hour. "This exercise occurred on a normal business day in many countries," Mossop said. "An availability rate of 20-30 percent of stations is very good and does seem reasonable as a planning assumption for future exercises." Largo, Florida - Private citizens, amateur operators and CERT team members gathered last month at the new Pinellas County EOC for a SKYWARN training class. Pinellas County is west of Tampa, Florida, with a population of almost a million, exposed to severe tropical weather on the coast of the Gulf of Mexico. Its county seat is Clearwater, and its largest city is St. Petersburg. The class was hosted by the Pinellas County ACS/ARES unit, along with their sponsoring agency, the Pinellas County Emergency Management agency. The Pinellas County ARES and ACS (Auxiliary Communications Service) are comprised of Amateur Radio operators who provide support to government and other agencies as needed. The class boasted 100 attendees, and was taught by Dan Noah, NOAA Warning Coordination Meteorologist at the Ruskin, Florida National Weather Service office. The class was welcomed to the new Pinellas County EOC by Emergency Manager Sally Bishop, who said in part, "This effort on the part of our ACS group netted the largest Spotter training class that Ruskin National Weather Service has ever had. We are grateful for the community service provided by the Spotters as it is a vital piece of the process that takes place between the Weather Service and Emergency Management to ensure the community is warned and as ready as possible for weather events." Noah said "SKYWARN is a program sponsored by your National Weather Service (NWS) consisting of trained weather spotters who provide reports of hazardous weather to help in the warning process. SKYWARN spotter reports provide vital 'ground truth' to the NWS. These reports serve the NWS mission of protecting life and property from the adverse impacts of severe weather. Each year our Spotters donate their time and/or equipment to help the NWS in the severe weather warning process." Clayton Parrott, KJ4RUS, Pinellas County ARES/ACS Radio Officer and Emergency Coordinator said "We are helping our citizens become more aware of weather related events such as tornados, lightning, and now the threat of El Nino by providing them with preparedness tools such as this SKYWARN training. In doing this, we help them to be better prepared for severe weather related events in their communities." There are no prerequisites to become a SKYWARN spotter, but spotters must be 18 years of age or older to receive a SKYWARN certification and a spotter ID number. Training included what to look for when reporting weather, what to report, how to estimate hail size, wind speed and the format to use, i.e., "TEL," which means Time, Event, Location. Since El Nino will be a major weather factor weather for the next few months, Noah detailed some of the added risks for Florida. Fourteen operators from various northern Indiana Amateur Radio clubs collaborated to activate the National Weather Service office in North Webster for the 17th annual SKYWARN Recognition Day (SRD) on December 5, 2015. When Michael Lewis, Warning Coordination Meteorologist for the Northern Indiana NWS office, asked for a radio club to organize the event, the Fort Wayne Radio Club accepted the task. Jim Moehring, KB9WWM, District 3 ARES DEC, served as the point of contact for volunteers to register. For security purposes at the NWS office, all volunteer operators were required to pre-register for operating time slots to gain access to the facility. Setup began at 2030 UTC on December 4. The set up team installed a custom made bracket to one of the parking lot light poles, which served as the common mounting point for three end-fed antenna matching boxes. The end-fed antennas have demonstrated their effectiveness and ease of installation in several other field operations. 20-meter and 40-meter tuned end-fed wires were stretched to conveniently located 30 foot tall light poles. Ropes were lifted over the light poles using an extended painter's pole. This avoided the hassles that are associated with air cannons and slingshot projectiles for such placements. A multiband Chameleon EMCOMM II end-fed antenna was placed over a third light pole using the same technique. A dual-band aluminum J-pole was placed 20 feet in the air on a telescoping aluminum mast mounted in a heavy-duty tripod base. Coax was run from the four antennas to a 4" diameter pipe pass-through in the wall of the NWS office directly into the operations conference room. The entire four antenna setup was completed before dusk at 2215 UTC. Three HF stations and one VHF station were quickly connected to the coax with time to spare before the 0000 UTC December 5 SKYWARN Recognition Day start time. The Northern Indiana NWS was activated for the full 24 hour period of the event. HF propagation ebbed and flowed during the event, but didn't dampen the spirit of the operators. Many contacts were made using IRLP via the K9DEW repeater outside Warsaw. The repeater owner/trustee, Dewey Thrasher, K9DEW, graciously permitted extended operation on his 145.13 MHz repeater IRLP node. Many NWS offices were connected to the IRLP Eastern Reflector during the event. The final QSO count of 181 total contacts included 46 other NWS offices. Some offices were contacted on multiple bands. Approximately 2/3 of the QSOs were with individual hams not affiliated with NWS offices. Â· Get a glass of water or something to drink. Â· Make yourself comfortable. Sit in a good location with plenty of room on a desk or table to write. Â· Have a good writing instrument and a back-up along with an extra piece of paper in case you need to jot down notes. Â· Take your time; go at your own pace. Remember, you are in control of the net and the frequency. Â· Don't worry about making mistakes; there are no mistakes to be made. Â· To handle the crowd that is trying to check in, you will develop your own way. Â· Stop stations from checking in ("Let's hold it for a minute") until you are caught up. Â· Weak stations and stations who give their call signs too fast, are always a problem -- skip them at first. Go back later for repeats. Â· Write your log as you see fit. You are the one that has to read it. Â· Headphones are a good idea -- they help you focus on what you are hearing and help keep you from getting distracted. At the January 9, 2016, Sacramento County (California) ARES Training Class held at Metro Fire District Station 106, past Sacramento County ARES Emergency Coordinator John Staples, KI6ZWW, received a plaque "in appreciation for all of his time and hard work spent to improve Sacramento County ARES and RACES during 2012-2015." District 3 EC Greg Kruckewitt, KG6SJT, and Sacramento County Assistant EC Vince Cracchiolo, KI6NHP, presented the award on behalf of all members of Sacramento County ARES/RACES and the Sacramento County Office of Emergency Services. While these numbers are impressive, they also show a clear problem - 38 ARRL Sections did not submit a report during 2015. In fact, for some it has been several years since a report has been received. It isn't too late though! SEC monthly reports for December 2015 may be submitted until January 31, 2016. These numbers only come from the SEC Monthly Report (FSD-96). This form provides ARRL HQ the overall picture of ARES in a section. The information used to complete this form comes from the local and district emergency coordinators; that is why it is critical for EC's and DEC's to report to their SEC each month. It is also worth noting that three sections, Eastern Pennsylvania, Georgia, and North Dakota, had 100% reporting from their respective SECs in 2015. These SECs as well as those submitting at least 9 monthly reports will be thanked with a special gift from ARRL HQ. On January 11, 2016, at approximately 1520 hours UTC, an unknown operator reported on 14.300 MHz, that a maritime in distress was heard on 14.313 MHz and that no one was assisting the vessel. Upon hearing the call, Maritime Net Control Station William Sturridge, KI4MMZ, responded to the frequency and received the Mayday call from Harold Hilman, K6RTD, aboard the sailing yacht "Second Wind." Hilman reported that his vessel was approximately 85 nautical miles south-southeast of Cabo San Lucas, which is off the tip of the Baja peninsula. Hilman advised that his 37 foot sailing vessel had lost its sails, solar power and its dinghy boat was set adrift. The winds were reported to be in excess of 20 knots. Sturridge notified the United States Coast Guard in Alameda, California and connected with Coast Guard Chief Sawanka. Chief Sawanka was then put in direct contact with the vessel in distress via a patch provided by Sturridge at 1542 hrs. It was reported that the United States Coast Guard ultimately notified the Mexican Coast Guard who was reported to be responding to the location to assist the ailing vessel. Dealing with maritime emergencies is not unusual for the Maritime Mobile Service Network. The net's regular operational hours are 1700 to 0200 UTC on 14.300 MHz but it's not unusual for Sturridge to listen at all other hours. In this case, not only did KI4MMZ listen but he responded to the frequency where the vessel was reporting the emergency. Quick and efficient thinking led to a quick response.